The first one was so successful, the state treasury is having a second auction on ebay to unload their unclaimed property. They just don&apos;t have the space to store it all. That&apos;s what State Treasurer Dawn Marie Sass says about the contents of safety deposit boxes in their possession. Under Wisconsin Statute, after 5 years of inactivity, financial institutions have to turn over that stuff to the State Treasurer&apos;s office for safekeeping. The online auctions make for a win, win situation. Sass says the money generated from the sale is earmarked for the last known owner of the items. Until that owner comes forward, the treasurer&apos;s office makes use of the money. Sass stresses there is no time limit for an owner or an heir to come forward and claim that property, which also includes uncashed utility deposits and paychecks, stocks and even forgotten bank accounts. 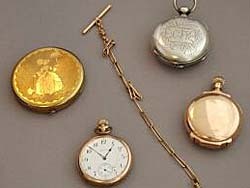 Some of the 29 items up for grabs right now on that ebay auction are jewelry, coins, sports cards and pocket watches. Sass recalls the most unusual item she came across was a Knights Templar Ring, sold in the first auction. Sass has spoken with other states who want to do the same thing, using Wisconsin&apos;s success as an example. NOTE: Currently, the State Treasurer&apos;s office has approximately $281 million dollars and $58 million in stock assets that belong to the citizens and businesses of Wisconsin. There are roughly over one million people in the state who are owed Unclaimed Property.